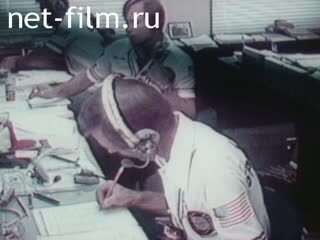 Operators: Bgancev I., Goncharov L., Semin V.
Text writers: Legat E., Pokrovskiy L.
The film about the first joint flight of the Soviet and American astronauts in July, 1975. In July 1975 the first joint flight of Soviet and American astronauts. On July 15 launched a Soviet ship in 7 hours 30 minutes - an American. On July 17 carried docking, July 21 made disconnection. The Soviet spacecraft landed on July 21, U.S. - 25 July. Interior of Yuri Gagarin's house (in Smolensk region). Spacecraft launch vehicle transportation; bust of academician S.P.Korolev. There is a reception in honor of astronauts in the Georgievsky Hall. The secretary general of the Central Committee of the Communist Party of the Soviet Union Leonid Brezhnev are talking to astronauts. The press-centre of flight illumination Apollo-Soyuz in Moscow (journalists are typing). Journalists are listening, there are astronauts in presidium (Yeliseyev, Shatalov, etc.). There are journalists by the docking unit model. Photo: V.Kubasov, L.Leonov and T.Stafford. There are astronauts having a rest, L.Leonov is playing tennis in the court. V.Kubasov and L.Leonov are undergoing medical inspection before start. L.Leonov and V.Kubasov are rendering a report, making a speech for the people seeing them off. Mission Control Center, the people at TV screens - LS. Portraits astronauts: T. Stafford (commander), V. Brand, D. Slayton. Control center (say through a direct connection between the Soviet and American mission control centers). 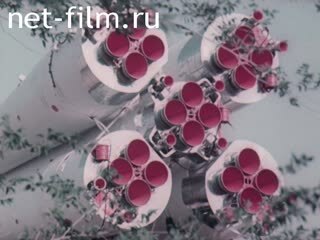 Docking of "Soyuz-19" and "Apollo" in space (with monitor). Transfer of astronauts through the hatch of T. Stafford connects Medal - MS., CU. Land (from space, with movement). Landing astronauts Leonov and V. Kubasov. Photographers, the astronauts of greeters. Astronauts wearing Kazakh national dress. "Apollo" comes down to the ocean, "Apollo" pribuksovyvayut to shore. At a press conference, said Leonov (synchronously), Kubasov (synchronously). Cosmonauts in Star: meeting, presentation of colors. Monument to Gagarin - CU. Leonov and Kubasov with spouses and children lay flowers at the monument to Yuri Gagarin - MS.